It feels so strange to go places like Disneyland without her. I felt terribly guilty at first, but I also still need to live life and also have new adventures. Alex and I have been spending a lot of time alone together while my husband has been traveling for business. It's important for us to get out as well and Disneyland is a relatively easy vacation for us to do on our own. We like to stay on property. I know that's expensive, but we don't have to spend money on rental cars or taxis to get to the park. It's also somewhat of a necessity since we need to go back to the room for a few hours midday each day to be able to enjoy the experience. Now that Alex is grown up, he is able to do so much more, but a crowded place like Disneyland is still a lot to handle. We enjoyed ourselves a lot the past few days. It was fun to see the Diamond celebration since we were there for the 50th ten years ago. We were also there for Fat Tuesday so it was festive to be in New Orleans Square that day. That's my favorite section of Disneyland! Alex loves Star Wars, Disney, and hanging out with his Mom so it was great fun for him! I absolutely loved it too! The weather was beautiful and sunny. It actually got too hot at 91 degrees but I kept reminding myself that I would be back in cold weather in just a few days. And somehow (without any planning), Alex and I ended up seeing Idina Menzel perform live one night while they filmed for an ABC special that will air on February 21st. You won't see us in the special because we were in the back, but we were there in the crowd! Crazy! I'll have to blog about that more sometime soon! 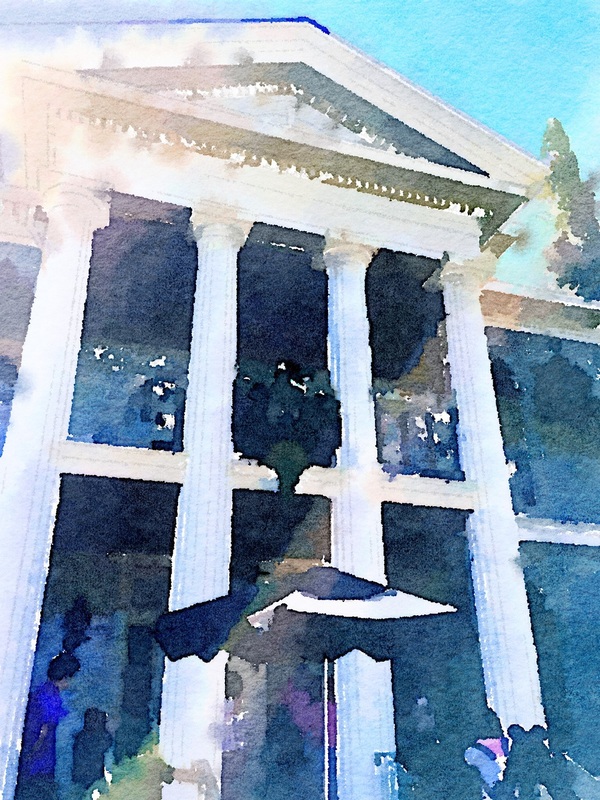 It was fun to turn some of my Disneyland photos into Waterlogue app creations here. Now I can't wait to scrapbook them! Hooray for going places!